They're not groundbreaking, and that's OK.
After years of trafficking in plastic flagships, the glass-and-metal Galaxy S6 and S6 Edge proved Samsung still knew how to make jaw-dropping phones. Ah, but there was a rub -- a few of them, in fact. The expandable memory slots were gone. Neither phone was waterproof. 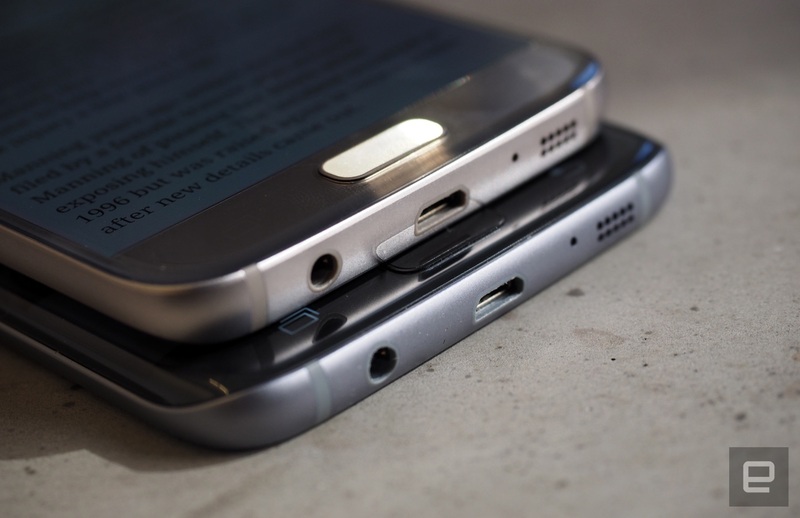 The S6 Edge's flat back and slim sides felt awkward. Curvy screens aside, both phones were identical. The shortcomings were few, but they were notable. Rather than start anew, Samsung's designers instead set about refining last year's formula, smoothing rough edges and making the new S7 and S7 Edge feel meaningfully different. Spoiler alert: It worked, and anyone even considering a new Android phone needs to consider owning one of these things. And yet, for all the polishing Samsung has done, these S7 siblings fall short of game-changer territory -- this is a year of careful, logical upgrades. 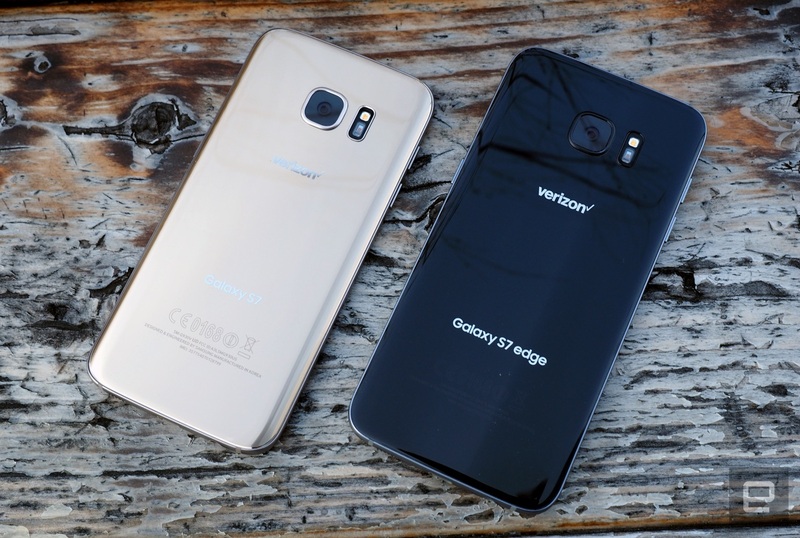 Another year, another Galaxy S. While the new S7 isn't as dramatic a departure for Samsung as the S6 was, it benefits immensely from a year's worth of refinement. It's more powerful, not to mention even more beautiful than the S6, but Samsung hasn't attained perfection just yet. That said, the company has come pretty damned close: A more consistent camera and more modest power consumption would have made this great phone one for the history books. 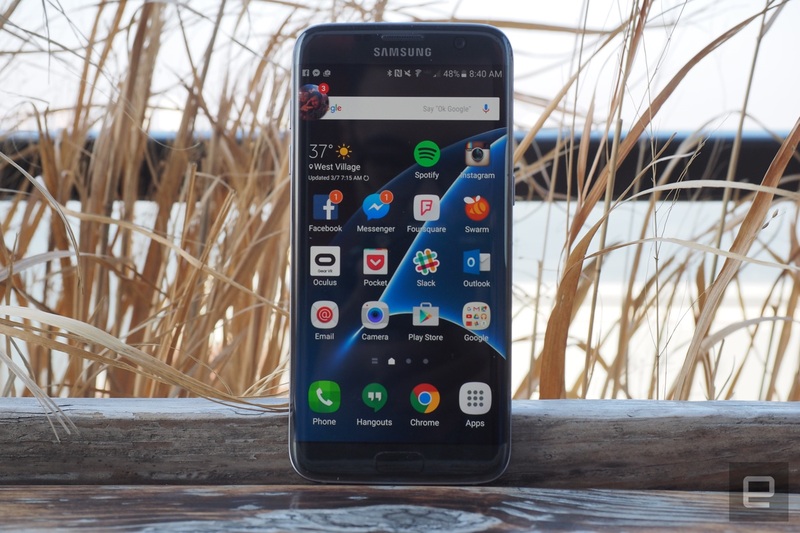 Be the first to review the Galaxy S7? This year's Galaxy S7 Edge is what Samsung's Edge family should have been from the beginning. It combines first-rate horsepower (and the occasional hiccup) with a gorgeous display, all wrapped in an attractive package. The thing is, the Edge's big draw is still its striking design: The software that tries to take advantage of the curved screen still feels gimmicky. 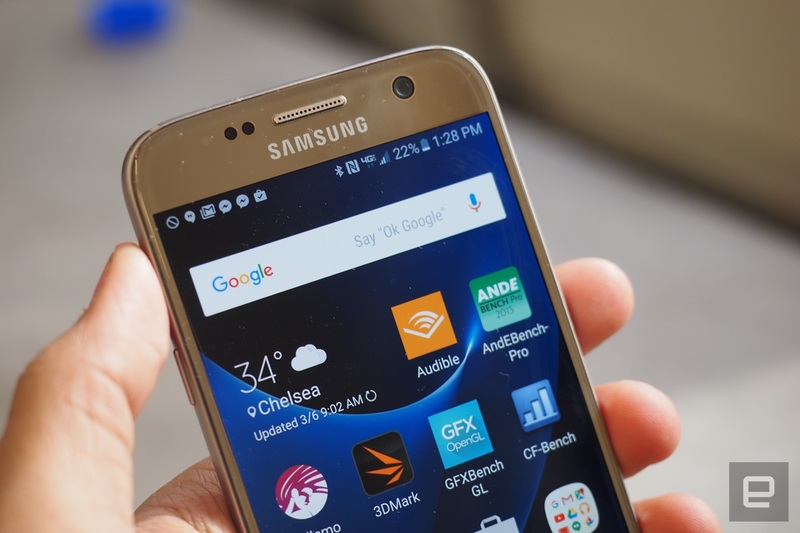 How would you rate the Galaxy S7 Edge? For all their physical differences, the S7 ($650 and up without contract) and S7 Edge ($750-plus) share many of the same internals. Thrumming inside both US versions is one of Qualcomm's Snapdragon 820 chipsets, which matches a pair of 2.15GHz processor cores with two other 1.2GHz cores. You'd naturally assume the international versions of the phone, with an octa-core Exynos chipset, would run smoother, but Samsung insists that the performance differences between these variants are basically negligible. I can't confirm that until I get my hands on an international S7, but you needn't fret much: The Snapdragon 820 and 4GB of RAM we're getting in the US offers plenty of power to work with. Samsung is particularly proud of its clever new 12-megapixel camera, which is featured in both the S7 and S7 Edge. Oh, and this time Samsung did a better job integrating those cameras into the phones' bodies; unsightly camera lumps are a thing of the past. Most important, Samsung took to heart our complaints about last year's models: The S7 and S7 Edge are IP68-rated water- and dust-resistant and accept microSD cards as large as 200GB to boot. That last spec is going to be especially important. While Samsung is indeed making versions of the S7 with 64GB of storage, you'll only be able to find 32GB models here in the States. It's a shame that the combination SIM and microSD card tray is so flimsy -- getting both cards in place often required as much luck as skill. And since security is more important than ever these days, both versions of the S7 come fitted with fingerprint sensors. All it takes to set them up is a surprisingly fast fingerprint registration process, and both of them do a reasonably good job recognizing my prints. Still, I think Huawei had the right idea with its rear-mounted sensor placement on the Nexus 6. Right, so those are the broad strokes. All things being more or less equal, let's dig into the standard S7 first. Don't let the word "standard" fool you, either: Just because this is the smaller of the two phones doesn't mean it's any less worthy. Samsung's strategy this year was all about refinement, so the few physical changes are minor. In fact, no one could blame you if you glanced at the S7 and mistook it for an S6. That'll change once you pick the thing up. The S7's 5.1-inch Super AMOLED display is covered by a very slightly curved pane of Gorilla Glass 4, lending it a "3D" effect that softens the transition from the screen to the phone's metal body. Since we're talking about curves, the S7 has rounded edges like the Galaxy Note 5, making the phone much more comfortable to hold despite being slightly thicker than last year's model. That plumper waistline is partially due to the S7's bigger 3,000mAh battery, and Samsung deserves credit for taking our power concerns seriously without compromising on the overall design. 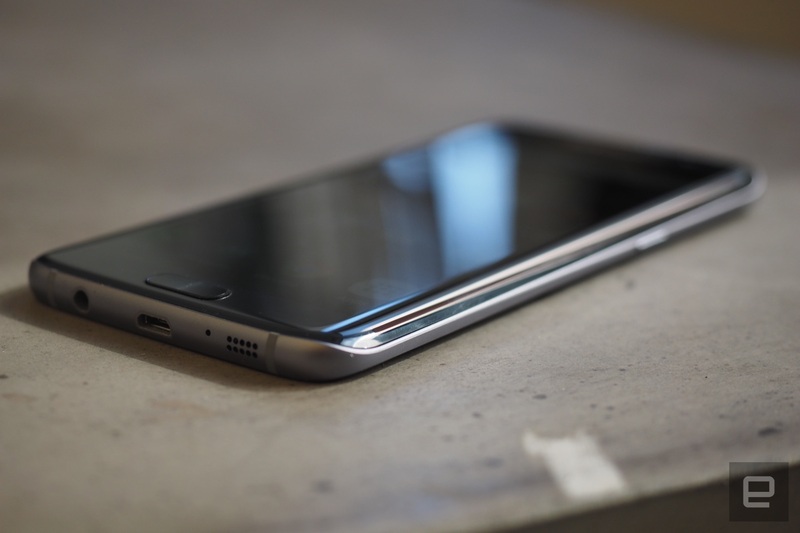 I praised last year's S6 for feeling seamless and complete, but man: The S7 manages to one-up it. For all the good this refinement did for the S7, it's the S7 Edge that really benefits. I can't overstate how much better this year's version of the Edge feels. It's a night-and-day difference. Remember, the S6 Edge paired a beautifully curved screen with a completely flat rear enclosure, forcing your fingers to arch over the back instead as you gripped those slender edges. This time, though, the S7 Edge is curved on both sides, meaning we've finally got an Edge device that nestles nicely into the hand. That's saying something, too, since the Galaxy S7 Edge is the bigger of the two S7 devices. While the S6 and S6 Edge were almost carbon copies of each other, the S7 Edge packs a 5.5-inch Quad HD Super AMOLED screen and a huge 3,600mAh battery. Fortunately, those beefier specs didn't get in the way of a seriously lovely design; I was shocked at how much slimmer and sleeker the S7 Edge feels compared with the iPhone 6s Plus, which also has a 5.5-inch screen. This is, quite simply, what the Edge line should have looked and felt like all along. There's no point in being coy: The Galaxy S7's 5.1-inch screen is amazing. That shouldn't come as a surprise, considering just how nice the S6's display was, and Samsung clearly didn't feel like messing with much here. That's fine by me. The same great viewing angles and super-vivid Super AMOLED colors are back, and since this display runs at Quad HD resolution, you can forget about trying to pick out individual pixels in text and photos. The level of clarity here is remarkable, just as you'd expect from a device with a pixel density of 577 ppi. In fact, by dint of having a smaller display, the S7 is even more pixel dense than its big brother, though the difference is near impossible to see with the naked eye. Speaking of the S7 Edge's 5.5-inch, curved Quad HD panel, these displays are more different than you'd think. For one, the Edge's screen isn't as nicely saturated as the standard S7's out of the box; colors seem richer on the smaller screen, which is also slightly brighter. My S7 Edge review unit also has a slightly green cast to it, though you'd be hard-pressed to spot it unless you had trained eyes or a normal S7 sitting right next to it. You can override some of the screen's color tendencies in the settings, though, where you can opt for the punchy AMOLED Cinema and the more subdued AMOLED Photo modes, depending on your taste. I doubt that subtle difference in color temperature will be a deal breaker for, well, anyone, but it's admittedly hard to un-see after you've been made aware of it. And honestly, curved screens just won't work for everyone. Let's say you're holding your phone in one hand and you stretch your thumb across the screen to tap an icon. If you've got meaty palms (like yours truly), there's a good chance that some of your hand-meat will hit the side of the screen and launch something you didn't intend to. Or said hand-meat could touch the screen and keep the phone from detecting other touch inputs -- say, taps from your finger. I eventually got pretty good at angling my thumbs to avoid these touch issues, but they still happen occasionally, and I roll my eyes every time. On the plus side, though, the screens on both the S7s have gained a neat trick. Like Samsung's Gear smartwatches, they now have an always-on mode so you can see the time and date at a glance. Once it's enabled, you'll have a handful of clock and calendar styles you'll be able to see even when the screen is otherwise off. If useful information isn't your thing, the phones come with three images (two of outer space, one of trees) to keep them looking pretty while idling. I prefer Motorola's approach, wherein you move the phone or wave a hand over it to bring the so-called active display to life. That said, Samsung's setup works well too, and seems to have a negligible impact on battery life. Now, I've always been a sucker for great phone speakers (thanks, HTC), but my expectations these days are pretty low. People who care about mobile audio quality are almost always using headphones to listen to their tracks, leaving phone makers to, well, phone it in where speakers are concerned. The single, bottom-mounted speakers in the S7 and S7 Edge, however, are a pleasant surprise. Though far from amazing, they're still louder and crisper than most single-speaker setups. You're obviously still going to be better off with a nice pair of earbuds, but either phone will do a surprisingly good job with your YouTube videos and audiobooks. The S7 and the S7 Edge both run Android 6.0.1 Marshmallow, so expect permissions pop-ups whenever an app tries to do something new, not to mention informational context cards when you invoke Now on Tap. Since I already gave Marshmallow the full review treatment, I won't dwell on what it brings to the table. Suffice it to say, though, it feels like the most complete version of Android to date. Now, after hearing us all complain about TouchWiz for ages, Samsung has spent over a year trying to streamline that bane of my existence. So far, the work has been surprisingly promising! 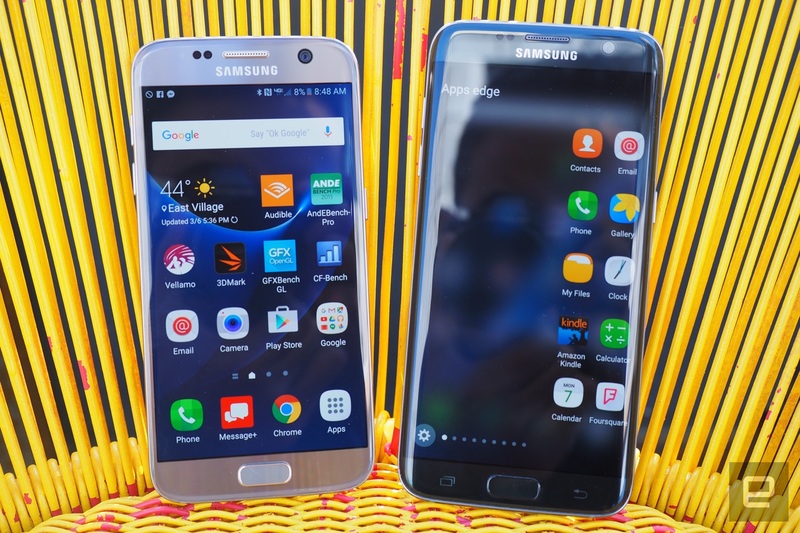 The S6, S6 Edge, S6 Edge+ and Note 5 all shipped with Android Lollipop, along with a version of TouchWiz that felt lighter and more responsive than ever before. This year, the changes to Samsung's software formula are pretty minimal. For one, the whole thing is a little less ... blue than before, when Samsung cast the Quick Settings panel in a subdued shade of teal. Now it's a crisp white, with blue icons and accents that stand out nicely against the pale background. Samsung also ditched the blue background in its app folders, which are now also a nice, flat white. Jump into the settings and you'll see some empty space for shortcuts; this field used to come pre-populated with options like Themes, Data Usage and Display, but now you have to add them yourself. And while the days of a separate app launcher seem to be numbered, Samsung still felt the need to fiddle with it. You can still arrange apps in alphabetical order or cook up a convoluted scheme of your own, but now you also have the option of searching for a specific app from the top of the screen. The same goes for the Settings page, actually: Thanks to Marshmallow, you can just search for options instead of rooting through everything. The list goes on, but Samsung's approach to TouchWiz is clear: It's mostly cosmetic changes that don't represent a huge departure from previous versions. That said, I'm also a little concerned about the effect TouchWiz has on the S7s' overall performance; the phones are generally very snappy, except for sporadic (and puzzling) cases of interface lag. Swiping into Flipboard Briefing -- a news-heavy home screen that's off by default -- can be jerky as all get-out, and sometimes swiping through home screens leads to noticeable stuttering. So that's TouchWiz in a nutshell. If you've picked up a Galaxy in the past 12 months, you'll feel right at home ... though this year gamers are getting more attention from Samsung than usual. One new feature, Game Launcher, consolidates all your games into a single spot for easy access. It's a simple enough concept, but it can be a little dumb, especially when it tries to automatically detect installed games. While I was setting up both new phones for testing, Game Launcher added the messaging app Slack for reasons I couldn't quite understand. Beyond the occasional fit of stupidity, Game Launcher smartly offers easy access to popular YouTube gaming videos, and videos related to the games you have installed on your phone. From there, Game Tools takes things a step further. After you've enabled it and started playing a game, a small red button will hover in a corner of the screen. 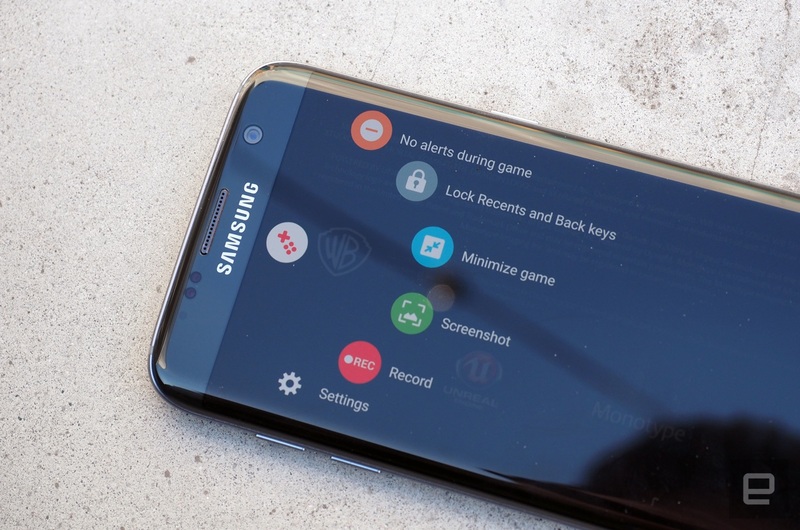 Tap it to bring up a list of convenient options, from a kill switch for alerts and a lock for the phones' touch keys to shortcuts for taking screenshots and recording in-game footage. I'm about as far removed from the Let's Play generation as a 27-year-old can be, but I can already tell more than a few people are going to love this. Then there's everything else. The fling with Microsoft that saw Office apps preloaded onto Galaxys seems to be over, as they're nowhere to be found on our review units. These particular units are meant for use on Verizon (Engadget's parent company), which means there's a folder full of eight preloaded apps, which some will undoubtedly find useless. Oh, and Verizon's Go90 video streaming service is here too, which is problematic for a few reasons. I don't want to watch anything on it, for one, and Verizon isn't charging Go90 streaming against customers' data caps, which would seem to run afoul of net neutrality principles. The S7 Edge, meanwhile, has all of that and then some. As always, the biggest software difference is the Edge UX, also known as "that menu thing you have to swipe the edge to access." By default, you'll have four panels ready to go. 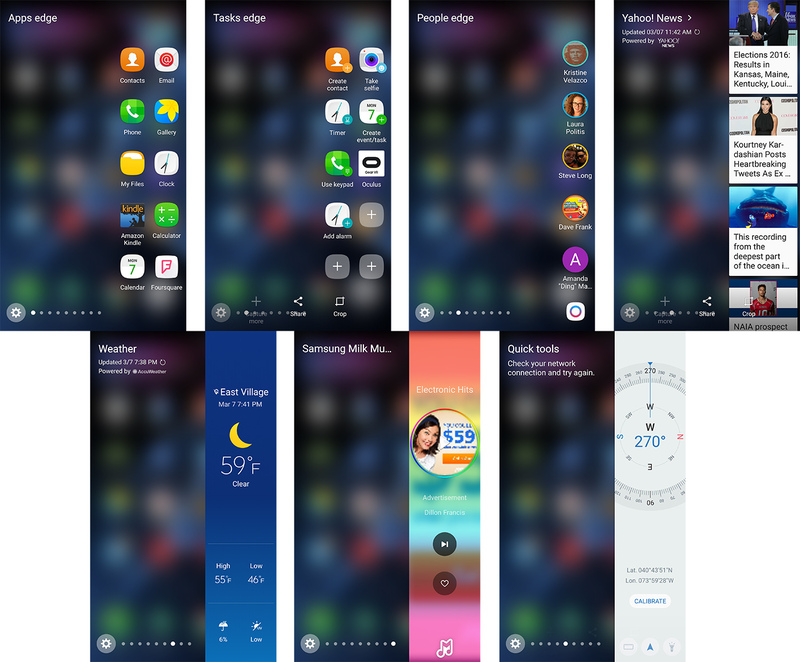 Apps Edge will feel plenty familiar to people who had the last-generation model; you'll still use it to quickly access apps you use frequently, but Samsung doubled the size of the panel to accommodate ten shortcuts instead of just five. 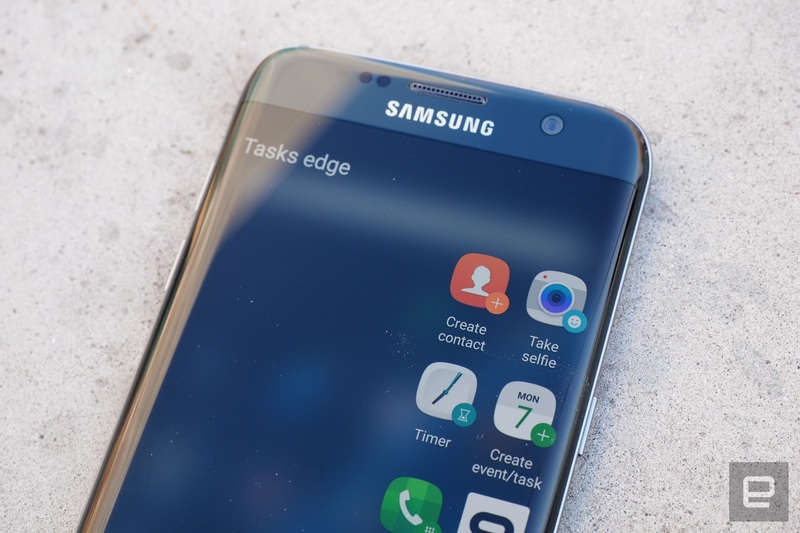 People Edge still only has room for five shortcuts, though it carries over the OnCircle feature from the S6 Edge+ that most people never used. Great! Tasks Edge is a fascinating addition to the mix. Rather than give you quick access to apps, it lets you perform specific actions within those apps with a single touch. The "take a selfie" task launches the camera and switches to the front-facing shooter; all that's left for you to do is hit the shutter button. It works surprisingly well for certain situations, but I was hoping we'd be able to create our own tasks involving third-party apps, like crafting macros for PCs. Alas, while I can create an email addressed to my boss with a single touch, I'd have to use apps like Tasker to cobble together more complex actions. Rounding out the default Edge panels is Yahoo News, which displays stories in a scrolling stream. There are a few other Edge panels waiting for you too, like a compass, calendar, weather report, stock prices and sports scores from Yahoo. Personally, I find some of these panels straight-up useless, but at least Samsung is trying to expand what its curved screen is good for. We're starting to see third-party developers build their own Edge experiences, too. A team called Sally Labs has a few available already, including handy monitors for RAM and data usage. Only a few big-name companies, like Twitter and CNN, have built Edge panels, with a scrolling list of trending topics for Twitter and a sort of vertical news ticker for CNN. The Edge keeps its original curved-screen tricks too, like allowing you to view your notifications by rubbing an edge while the screen is off. Adding your friends to People Edge still assigns them a color that makes the phone's sides glow if they call while the device is facedown. It's a neat trick, but my neurotic nature keeps me from ever leaving a phone facedown on a surface anyway. Samsung's decision to make the S7 Edge a physically distinct phone was a smart one: It's different enough from the regular S7 that people will want one for reasons beyond the curved screen. Still, make no mistake: The S7 Edge's big advantage over competitors still mostly comes down to its looks. These new Edge experiences are inching closer toward actual usefulness, but it's not like Samsung had some amazing software ideas that could only shine with the help of a curvy display. No, it's obvious that Samsung is trying to cook up software to better justify the screen's existence. As far as I'm concerned, though, there's nothing wrong with designing something beautiful for the sake of beauty. Don't let the dip in megapixels fool you: The 12-megapixel cameras in the S7 and S7 Edge are no slouches. I spent much of my week testing the S7 siblings against the iPhone 6S Plus. The comparison seemed especially apt, since Apple also recently bucked the high-megapixel trend; its newest iPhones have 12-megapixel sensors, whereas many other phone makers are aiming for 16 megapixels and beyond. 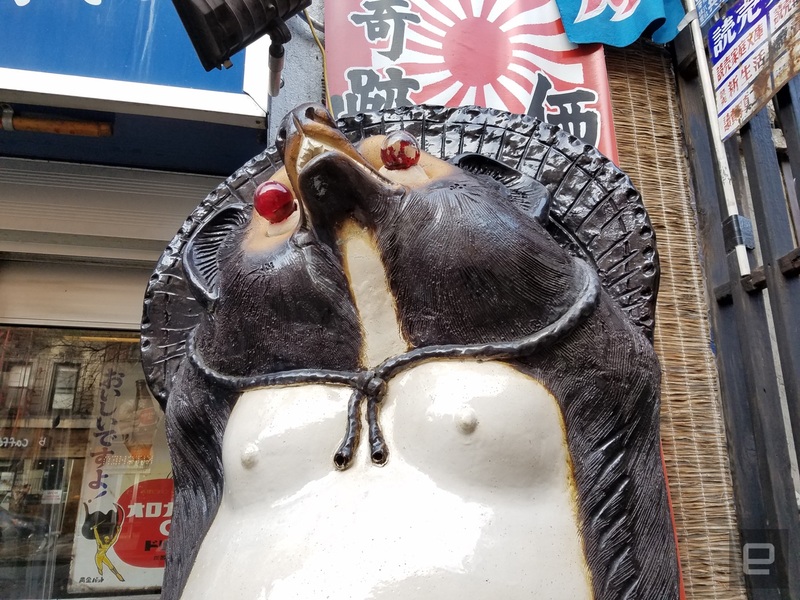 Anyway, in most straight shoot-outs, the S7 family did a better job capturing fine detail, from the lumps on a slapdash paint job to the meticulous fur etchings on a tanuki statue. Colors also came out punchier with the S7 and S7 Edge, though never to the point of being imprecise. In fact, most of my test photos looked vivid, even when the sun was hiding behind some clouds. We can peg part of that on how the S7 and S7 Edge process photos, but the f/1.7 aperture lens and the larger pixels on the sensor itself deserve some credit too. Combined, these two features increase the amount of light the sensor absorbs, resulting in brighter, more appealing photos. Oh, and the 5-megapixel selfie camera made me feel attractive, so there's that. The S7 series cameras also focused faster than other devices I tested them against. Rather than use, say, a laser autofocus module, Sony -- the company behind this so-called DualPixel sensor -- brought a sophisticated focus system to a smartphone. To make a long, jargon-filled story short, every pixel on the sensor has two diodes that are used to help figure out how to focus on the subject. The result is crazy-fast focus speeds -- my finger was barely done tapping the screen before the camera finished locking onto my target. I was feeling pretty great about things until I started comparing the S7's results with some photos shot with the Galaxy Note 5 and its 16-megapixel camera. Its higher resolution allowed it to pick up even more nuance in statues, landscapes and human subjects, while matching the S7 on color reproduction. In certain conditions -- usually bright natural light-- the Note 5 took more appealing photos. The trade-off here is that while the S7 and S7 Edge lack the edge (ha!) in resolution, they're both noticeably better than the iPhone and Note 5 in low-light environments. Bear in mind, they're definitely not going to replace your Sony A7s; you'll still see lots of grain, and most shots feel a little overprocessed, but I was able to consistently leave the flash off and still achieve results good enough for Facebook and Instagram. Fortunately, the camera interface hasn't really changed since the Note 5 came out, which means you don't have to do anything to get good-looking shots. There's a Pro mode in case you want to fiddle with your exposure values and shutter speeds, and the usual selective focus, video collage, virtual shot and live broadcasting modes are back too. New here is a Hyperlapse mode, which does exactly what the name suggests. 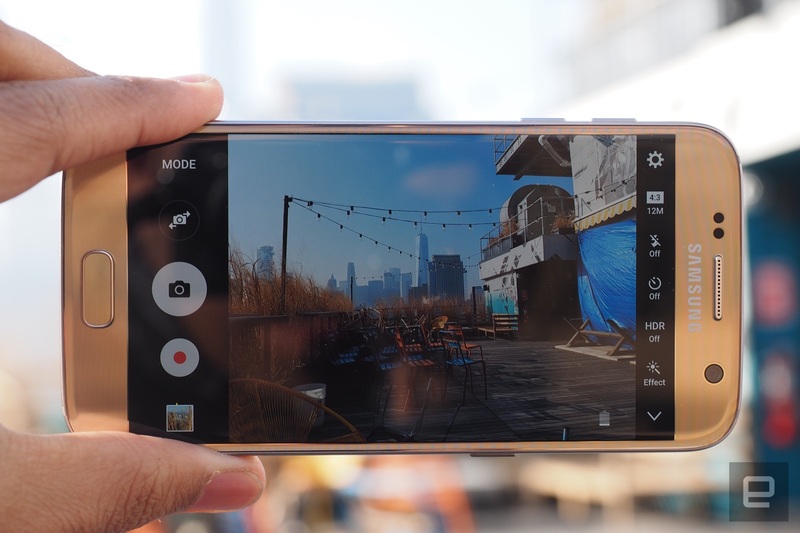 There's also something Samsung calls "motion panoramas." Basically, when the feature is enabled, the camera shoots a panoramic video in addition to the usual super-long photo. Then, when you play it back, you can rotate or move your S7 or Edge to see the panorama come to life in front of you. Useful? Maybe. I wonder how many people actually bother shooting panoramas. Is it neat, though? You bet. The video experience is generally pretty lovely here, too -- resulting footage was crisp, bright and well saturated, though you lose niceties like tracking autofocus when you jump into 4K. All told, the camera experience on the S7 and S7 Edge is more of a mixed bag than I hoped. The sensor powering everything is one hell of a technical achievement and gives both phones low-light and autofocusing superpowers. Still, just a little extra resolution would have been nice. Samsung has historically been good about balancing polish with technical progress. As for this year's models, it's hard to argue with the quad-core Snapdragon 820 chip and 4GB of RAM used here. During my week of testing, the Galaxy S7 handled anything I threw at it with grace. That was almost always the case with the S7 Edge too, except the few times it wasn't. Once in a while, I ran into some lag that made navigating home screens, popping into Flipboard and switching between apps feel strangely jerky. I can't tell what's causing this weirdness either. It might be some issue with TouchWiz, or maybe some overzealous CPU throttling. For what it's worth, the S7 seemed immune to these technical hiccups; only the Edge had occasional stutters. These issues popped up from time to time on the S6 twins too, but I was really hoping Samsung would have ironed out the kinks by now. Meanwhile, our usual slew of benchmark tests point to some notable boosts in performance, especially when it comes to graphically intensive tasks like gaming. 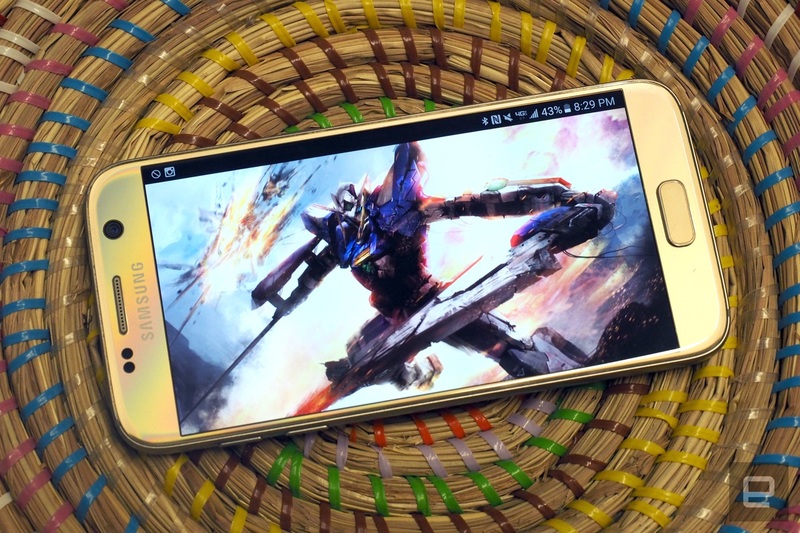 The S7 siblings are the first smartphones available that play nice with the Khronos Group's Vulkan API, which should make for a new breed of console-grade mobile games. 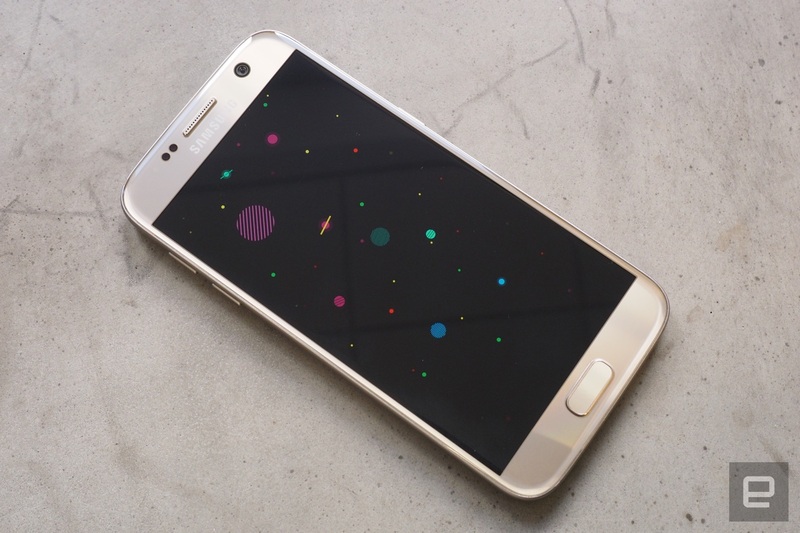 Remember Tim Sweeney's gorgeous demo during Samsung's S7 press conference? Vulkan-powered games haven't hit the Google Play Store yet, sadly, but it's clear Samsung is taking its future in gaming seriously. In the meantime, games like Dead Trigger 2, Asphalt 8 and Mortal Kombat X ran like butter, thanks to the addition of the Adreno 530 GPU. Interestingly, the S7 seems to pull ahead in most of these tests -- you'd do well not to count the smaller phone out. Our usual battery rundown test entails setting the screen brightness to 50 percent, connecting the phone to WiFi and looping an HD video. I had high hopes for the Galaxy S7 Edge and its hefty 3,600mAh battery, but the improvement was actually fairly modest. All told, it hung around for 14 and a half hours, only about 40 minutes longer than the Galaxy Note 5. The Edge fared much better in mixed use. I'd usually disconnect it from the charger at around 7:30 AM and use the thing nearly nonstop until I finished work at about 8 PM. Throw in a little light Kindle app reading and a few Spotify playlists and the Edge would usually hit 10 percent around the time I went to bed. And since Marshmallow's Doze feature kicks in when the phone is still, I'd wake up with just enough juice to check a few emails before plugging it in. Meanwhile, the regular Galaxy S7 survived our video gauntlet for 13 hours and 20 minutes, slightly trailing the Note 5. Mixed use also suited the smaller phone better: It'd routinely come off the plug at 7 AM and stick around until just before I fell asleep at around 1 AM. Both of these phones showed decidedly above-average endurance, and will easily see you through the day. Like I said, though, the difference over last year's models is subtle. By virtue of timing alone, the Galaxy S7 and S7 Edge are two of the most powerful, desirable Android phones on the market. That said, you should still be mindful of other options. Take the Nexus 6P ($499 and up), for instance. While it lacks the latest Snapdragon chipset, its mix of top-tier power and a clean Android build make it a potent contender for the "Best Android Phone" crown. Then we have LG's recently announced G5, which as of this writing isn't out yet. It pairs the same Snapdragon silicon with either 3GB or 4GB of RAM and a 5.3-inch Quad HD IPS LCD screen. That's a painfully reductive way to look at the thing, though, when you consider that LG is responsible for building a proper, modular flagship smartphone. It remains to be seen whether the G5, with its swappable doodads and weird dual-camera setup, will find a foothold in the market. But on some level it doesn't matter: LG finally made a more exciting flagship than Samsung. 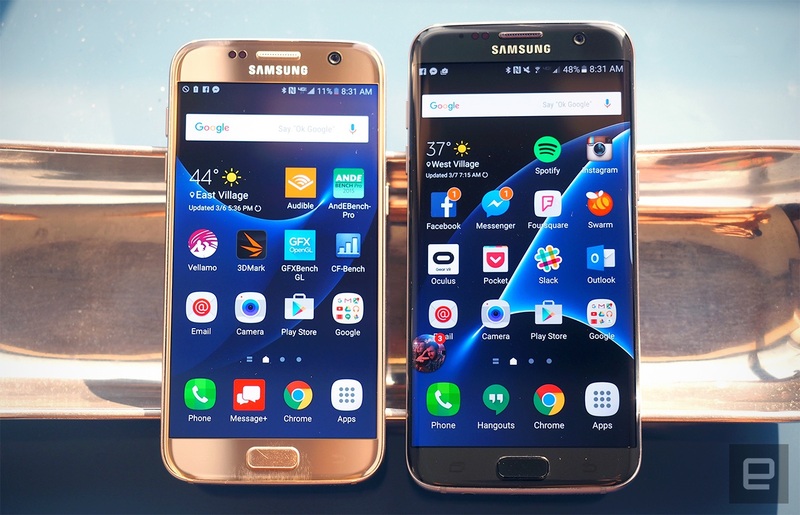 The S7 and S7 Edge bear some thematic resemblance to the iPhone 6s ($649 and up) and 6s Plus ($749 and up), another pair of devices with different form factors built around near-identical brains. They're obviously not Android phones, but they're the spawn of one of Samsung's biggest rivals, and meld a surprising amount of horsepower with a fantastic ecosystem of apps and the sort of touch-sensitive screen we all thought the S7 clan would get too. They may not be revolutionary, but Samsung's new Galaxy S7 and S7 Edge are powerful and well built, making them worthy sequels to what were previously its best-ever phones. More important, there are now distinct reasons to buy each. The S7 is one of the finest phones I've ever tested, while the Edge has the screen and battery to (mostly) satisfy mobile movie buffs and phablet diehards. That said, I was hoping for a bigger boost in longevity, considering the size of this year's batteries. And the cameras, while generally very good, aren't an across-the-board improvement over last year's. Even so, if you're in the market for a new, not too big Android phone, your search should start with the Galaxy S7. And if you're a sucker for style, as I know many of you are, the S7 Edge does a good job balancing power and prettiness. Though these are just the first of several flagship phones to arrive this year, we can already say that Samsung's latest offerings are well equipped to take on the competition.